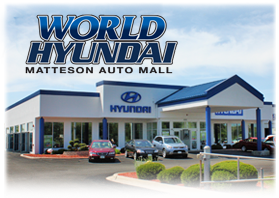 World Hyundai is having one of the largest (if not THEE largest) garage sale event in Matteson, Illinois history! Save thousands of dollars on new or gently used items that are being sold by our families, friends, employees, and also from the general public! We’ve invited everyone to come out and BUY or SELL items at our huge garage sale! We plan to have 200 tables available for those who would like to sell items. If you are interested in selling items at our garage sale near Chicago this weekend, please contact Vivian at (708) 532-5983 and reserve your table. In addition to the savings that we’ll have at the garage sale tables, we will also be marking down vehicles to garage sale prices and selling several vehicles at just $1,500! We will also have staff on site to be able to give you a free appraisal on your current vehicle, just in case you happen to also be in the market to purchase a new or used car. This is a FREE EVENT and is OPEN TO THE PUBLIC all day long on Friday, May 30th and Saturday, May 31st in the back of the Matteson Auto Mall. Bring your family and friends! This is as close to a large flea market as it gets! Let the kids enjoy our bouncing house while you shop or work at your table. We hope to see you here this weekend!